When you land at the airport in Obregón, Mexico, as we did on our way back from Puerto Vallarta, you can buy candied apples for $2 a piece. And here's the best part - the Mexican Immigration and Customs officials are the ones selling them! Like Girl Scouts selling cookies they have them sitting right there on the desk in a cardboard box. A dozen or so beautiful tamarind candied apples wrapped in cellophane and tied with little ribbons. I'd love to know how the wife suckered her Customs Official-husband into selling her apples to tourists. "Gustavo, just a few, por favor. They'll love them, just you wait." And we did. On the way down we bought one and the way back we bought five. How do you like them apples? After tasting the tamarind apple I will no longer be able to eat a regular old caramel apple (when was the last time I had one anyway I cannot tell you). It was unlike anything we had ever eaten. Crisp Granny Smith apples were wrapped in a paste made of tamarind (a sweet and sour fruit pulp), chili powder, sugar and salt. The result is a perfect balance of sweet, sour, salty and spicy. Wouldn't it be nice if our Customs officials sold sweet little treats to tourists...apple by apple we could whittle away at the national debt! I agree...these little beauties are WONDERFUL!!!!! Yum, I love these things! It was the best fruit-gone-candy I'd ever had. I checked with our food co-op this week and found that we stock a tamarind (tamarindo en espaniol!) paste, but we were out of stock. Maybe my fellow members are already onto the goodness. I am looking forward to apple season in the NW! Thanks for the post. I'll be experimenting with the ratios of these ingredients. I can only hope to replicate this recipe! You are right, carmeled apples do not even come close! does any one have the recipe yet? i have heard great things about these apples and i can not find them. i will try to make my own and find out if the stories i have heard are true. I had one at a baby shower recently and was hooked. But I can't find a recipe anywhere. Any suggestions yet? Good news!!!! I have the e-mail of the people who are selling these apples,. I tried them and they are out of this world!! 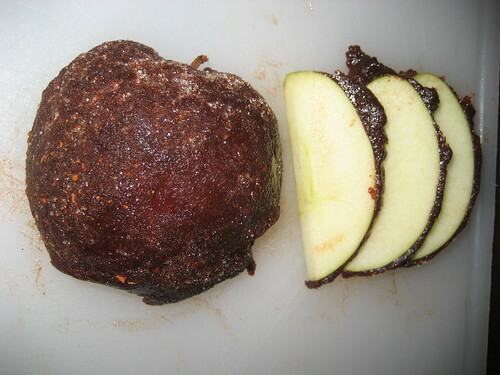 Hey do any of u know how to make apples with tamarindo and chilie powder? Thanks, Alexis!! I have an email in to them for the recipe. If they provide it I will post it! Cheers! Darn, it's a secret recipe so they kindly declined my request. In the meantime, if anyone knows how to make these, please let us know! In the meantime, I'll be working on it in our test kitchen. Cheers!